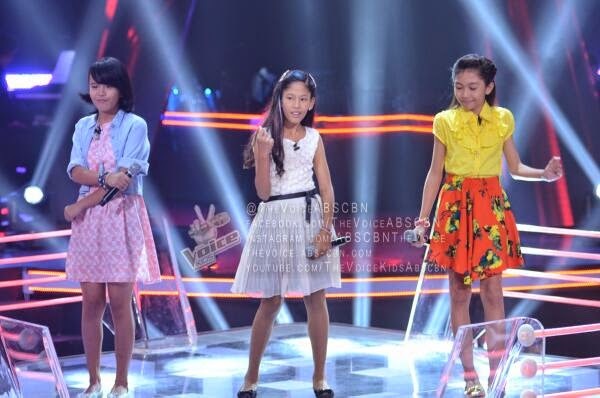 Manila, Philippines - Sarah Geronimo's young artists clashed in the much-awaited "The Voice Kids" Philippines The Battle Rounds on Saturday, July 12, 2014. It was a battle of vocals between Triscia Jumawid, Diana Agustin, Hannah Uganiza as they performed Dianne Reeves hit song "Better Days". Coach Lea chose Diana while Bamboo chose Triscia. Coach Sarah picked Diana as the winner in the three-way battle. She will advance to the next round of the competition – the Sing-Offs. Coach Sarah made a hands-on approach to train her young artists in her bid to assemble the strongest team that will compete with Team Lea’s Darlene and Tonton and Team Bamboo’s Juan Karlos and Edray in next week’s live Semi-Finals. The episode of The Battles on Saturday dominates online conversations with '#TeamSarahBattles', 'Go Darren', 'A Thousand Miles', 'Mitz, 'Musika' and 'Neon Lights' among the trending topics. Don’t miss the fun and excitement in “The Voice Kids,” as it consistently rules nationwide TV ratings according to Kantar Media and AGB Nielsen.